Serves 6. Preparation time 20 minutes. Cooking time 20 minutes. • Heat ha If the butter in a pan and fry the bacon until crisp. Drain on kitchen paper and cut the bacon into small pieces. 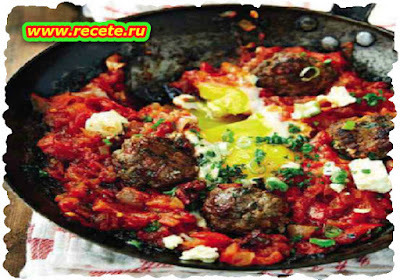 • Squeeze out the meat from the boerewors casing and mix with the bacon and the rest of the meatball ingredients in a bowl. Make 24 snack-sized meatballs and refrigerate - they'll stay fresh for up to 4 days. • Melt the rest of the butter in a large pan and fry the meatballs until cooked and golden brown. • Remove the meatballs, but leave the pan juices. Pour the smoor into the pan, add the red pepper and simmer for a few minutes. • Return the meatballs to the pan. Use a spoon to make 6 pockets in the smoor and crack an egg into each pocket Put the lid on and simmer for about 4 minutes until the egg whites have set, but the yolks are still runny. • Sprinkle with cheese and serve with toast.